The Slim and stylish Nikon Coolpix S220 is an amazing digit camera which comes with handy features at a decent price. Nikon Coolpix S220 comes with slight upgrades of features as compared to the previous Nikon model in the S-Series. This ultra slim digital camera comes with advanced features like 10 megapixel imaging sensor and various modes for adjusting the image quality. To add a different touch to photos the Nikon Coolpix S220 comes with various modes like black and white, sepia, pastel, cyanotype and vivid effect. 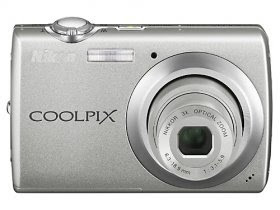 It features a 3x Optical Zoom for enhanced imaging quality especially for close up photography. The lens used is NIKKOR Glass lens with Vibration Reduction (VR) stability feature for an advanced imaging experience. Nikon Coolpix S220 uses the Nikon’s Smart Portrait System and Exceed image process for its functionality. This advanced technology helps to boost the overall performance of the camera. Nikon Coolpix S220 has a bright high resolution LCD display screen of 2.5” which helps the users to take photos easily and navigate easily to various functions. Users can easily change the contrast and the brightness of the screen as per their requirement. In spite of its numerous features the Nikon Coolpix S220 happens to one of the slimmest and lightest digital camera; it has 2.2” height x 3.5” width x 0.7” depth and weighs nearly 100 grams. If you’re looking for some great photography without having a hole in your pocket, then Nikon Coolpix S220 is certainly the right pick for you.